Invest your money in a Residential Housing Project for more returns. 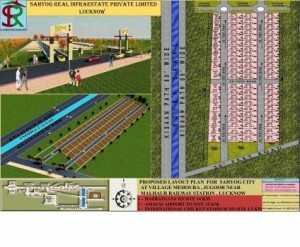 OFFER Rate : Rs .375-pr sqft. So Book your Plots & Get more returns. JUST 20 MINUTES DRIVE FROM POLYTECHNIC. Locality: Kisan Path(Indra Canal) near to crossing of Satrikh Road,6km fro Amity New Campus,8km from Chinhat,5.5km from Faizabad road,8km from Sultanpur road,Beside Lohiya Awasiy Yojna,18km from Hazarat Ganj in Lucknow District.